Pixar strikes again, and once again, strikes gold with their newly released Wall-E. Prepare to be mind-boggled by this explosion of creativity, art, humor, and classic mores. 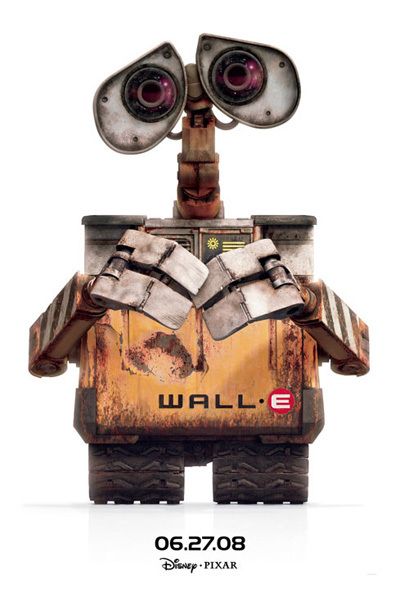 Right off the bat, Wall-E, a trash-compacting transformer programmed to clean up a deteriorated earth, charms his audiences with both his technological functionality and his personality quirks. These include, but are not limited to, windshield wipers for eyelids and a Hello Dolly fetish. But the fun does not stop with Wall-E. EVE, Wall-E’s love interest, has a fiery personality, especially when she whips out that nuclear blaster. She also is quite stylish, clearly designed after a Wii character. When Eve gets transported back to her home, the spaceship Axiom, Wall-E follows along determined to be with his love. What he finds is the 700-year old home of the exile earthlings, who have, thanks to the technology of floating chairs and robotic servants, all become helpless, videosized couch potatoes. Though the people are pathetic, and conjure up images of dystopia, the different kinds of robots on the ship are positively fascinating in their varied tasks and capabilities. These creatures range from Mo, little neat-freak robotic sweeper, to the Wall-A, a giant Wall-E trash compactor, to Otto, the automatic pilot for the Axiom, shaped like a nautical helm. Something I didn’t mention: There are very few words in the movie. I say, Who needs them? The movie hearkens back to silent films of old, a strange and yet magically suitable complement to the technology of the future. It works. I am not quite sure how, but it works. I cannot recommend this movie highly enough. I also feel that should I share anymore I would be doing readers a disservice. So go see this movie! See it multiple times, as the first time will surely not be enough to pick up everything. And don’t go late at night: you will need to pay attention. Also, stay through the credits to see the ways in which hundreds and hundreds of people were used to put this film together. There is even a section with the names of Production Babies, babies born during the course of the film-making. There were about 30-40 names. If you recall, these lyrics come from Disney’s Pocahontas. 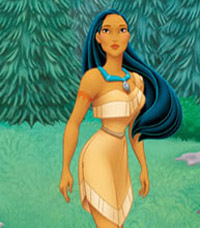 You remember, that early 90’s film that was overshadowed by the Lion King, the one where they made Pocahontas into a 25-year-old Indian Barbie who has a love affair with a Mel Gibsoned John Smith? The movie, as a whole, was really ridiculous. Not only did it destroy any chance of being historically accurate, but it also conveniently had cute, little, furry characters predestined to be marketed in toy stores across America. Despite its flaws, the movie is redeemed, at least partly, by the song, Just Around the River Bend. 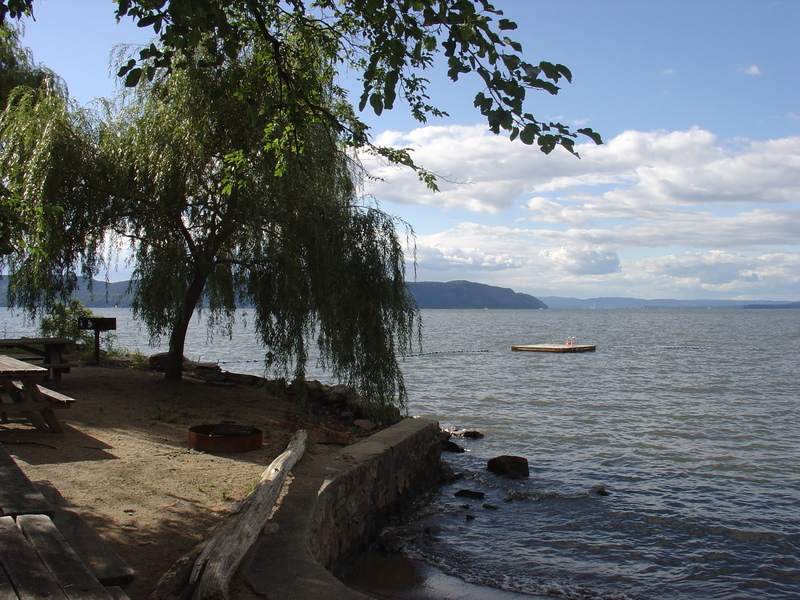 Now, I may be biased, as I was raised by, and partially in, the Hudson River. Rivers have a special place in my heart. Indeed, I claim the Hudson River as my own: I am one with the River, I am the River Queen. I identify wholeheartedly with FDR who once said, “I am pure Hudson River when it comes down to it.” That river is in my blood (possibly even literally, as yesterday a big wave whacked me clear in the face and got down my throat). Pocahontas was right in saying that we can never step in the same river twice. The River never even looks the same from one day to the next. Though there are certain things I can predict about the River, such as how northwest winds are the steadiest and South winds carry a northerly current that potentially could take you to Albany, the River is nonetheless full of surprises. Yesterday, for instance, while sitting on the rocks at near high tide, the waves splashed up underneath my legs and made the most wonderful, robust flagellant noises. I felt pressed to giggle (It wasn’t me, I swear!). That added to the elegant glistening of the setting sun and the gentle westerly breezes blowing my hair away from my face, I began to sing praises to God for his mighty waters. Pocahontas’s song also makes the interesting parallel between rivers and people. People tend to be reluctant to change and flow. But why should we try to be beavers by incessantly making dams? Surely there are times when we should refuse to go along with the flow, such as with Naziism, or relativism, or other -if-your-friend-jumps-off-a-bridge-will-you-go-too situations. But most of the time, going with the flow is an excellent strategy. This is especially true, it seems to me, when safe in the Hands of God, as we are, and when He is in control, which He is. I empathize greatly with Pocahontas when she sings, “Why do all my dreams extend just beyond the River bend?” It seems that I always want to know what is ahead. There are several reasons for this, most of which have to do with my own impatience. First, I am impatient with God that I do not have the gift of prophecy. Why do I want this gift? Well, wouldn’t you like to know what is to come in the hopes of being able to improve upon it? What if disaster looms, could we not prepare better with such a gift? But alas, this is not for us to know. I am impatient that I cannot know even the good things, such as my calling or callings in life. At the moment I feel like a tightened corkscrew spring, ready to burst forth into a life full of opportunities. Just what is holding me back at the moment, I don’t quite know. God, though an excellent teacher, is slow (in Emily time) to teach. I feel weary constantly holding in all of this potential energy, and Iyearn painfully to see what lies ahead. Perhaps this is all to deep of an analysis for a movie, and a Disney movie at that. I say phooey. Even Disney movies, however unintentionally, have fodder for discussion. Just don’t get me started on Beauty and the Beast. I always thought it was ridiculous that we had to choose our audience in my last writing class. In real life, I thought, we never get to choose our audience: if we are in school, then our teachers are always the audience; if we are not in school, then the readers of the magazine, newspaper, novel, memo or journal are always predetermined. But what about blogs? Blogging audiences are nebulous. Indeed, I don’t exactly know who is out there reading this. Why should you care? What’s more, how can I entice you to care if I don’t know who you are? I suppose my blog could assume a set tone, a particular attitude towards the subject matter, and eventually the blog may develop its own following. This seems very passive on my part. Not to mention, what human being alive has simply a single mode of thinking and speaking? It is like assuming that people must choose a single mood by which they shall forever be characterized: “You there! You shall be named Grumpy and Grumpy you shall be!” Thank you, but I for one would like to abstain from most any association with the seven dwarfs. One thing is certain: This blog is no basin for spewing out sentimental gunk that, I confess, occurs frequently in my head. Lord knows, whoever you are out there, you do NOT need to be burdened with such rubbish. I am sure there are plenty other blogs you can go to for that. -Brings joy to the everyday. So whoever you are out there, I do hope to get to know you somehow. But in the meantime, I suppose I will just have to shoot blindfolded. There is nothing like a good sneeze. It is true. Have you ever noticed how revitalized you feel after a good sneeze? Sure, snot may be flying out of your nostrils at a zillion miles an hour, completely uncontrolled both in timing and direction, but I say enjoy the cleansing process whenever you can. Not only do you feel cleaner after you sneeze, but people around you bid you their blessings. Sneezes are wonderful.